A store located in the Old Town of Nice in Provence, France has a vast display of pottery goods which have been made locally and uniquely designed. As you wander around this store in the Old Town of Nice in Provence, France, an entire section displays various types of items made out of pottery which can be used to decorate anybody's house. Small bowls, pots, vases and bathroom items are just a few of the pottery creations on this wall display and when shopping here, hours can be spent just browsing through the pottery section.Talented people spend many hours molding the pottery goods for sale at this store and after they have found the perfect shape, hand drawn designs and glazing must still be done. 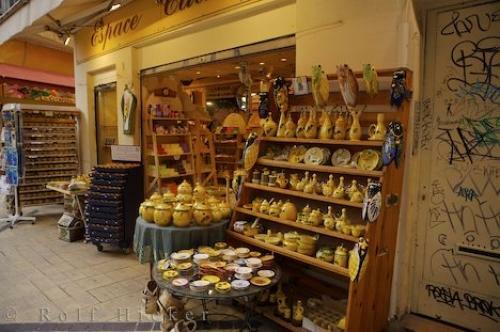 This pottery store in the Old Town of Nice is the ideal location to find the right gift for friends or family members.Pottery store in Old Town, Nice, Provence, Cote d'Azur, France, Europe. Photo of the pottery items on display at a store in the Old Town of Nice in Provence, France in Europe.